Robots blow bubble walls and algorithms make miniature landscapes in “Automatic Architectures.” Wall on display at the Arsenale in Venice. Photo: Alberto Canepa. 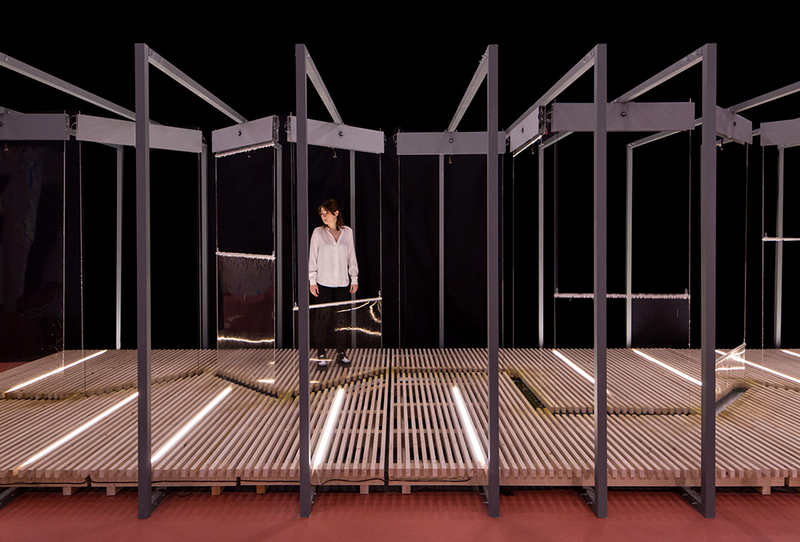 Presented at the Venice Architecture Biennale, Automatic Architectureexamines the space of automation and algorithms in architecture through two projects, Wall and Space. The projects were realized as part of a workshop led by Riccardo Blumer at the Academy of Architecture at the University of Italian Switzerland in Mendrisio, Switzerland with support from U.S. non-profit MADWORKSHOP. Automatic Architecture presents two different collaborative projects. Walls is a series of roboticized bars pulling planes of soap bubbles, stretching them to their physical limits until they lost their form. “It contemplates a space in which tangible walls can be there one minute and gone the next,” as Blumer says in a video produced on the project by PLANE—SITE. The 11 rods that stretch out the panels of the wall begin together but invariably fall out of sync with one another as they attempt to create a complete, continuous wall. Defined by its ephemerality, Wall generates a space that “simultaneously does and doesn’t exist.” Walls is a collaboration between Lorela Arapi, Stefano Clerici, and Andrea Cappellaro. Space presents a grid of automated blocks that rise and fall in a constantly shifting pattern determined by an algorithmic model that can run without repeating a form for 250 years, suggesting that architecture is itself constantly in flux and highlighting the tension between order and expression. Space was created by Georgios Voutsis.